Beaming with confidence, 37-year-old Tina Tuonyon proudly sits by her large market stall in Greenville, the capital city of Sinoe, a rural county in southeast Liberia. Just two years ago, she sold tiny bags of charcoal from a roadside stall on the outskirts of the small market in her community. In 2005, as a single mother Tina used to walk four to five miles to a nearby village to buy two bags of charcoal for resale in her community. Twice a week, she would tote the heavy bags back to Greenville, empty the charcoal into smaller plastic bags and sell each of them for $10.00 Liberia dollars (USD 10 cents). This was her business. “It was on the profit made from those two bags of charcoal that my son and I were fed and that his school fees were paid. On many occasions, I ran out of money and had to start over again,” adds Tina. Given the unpredictable nature of her income, Tina was determined to do better. She dreamed of becoming a businesswoman, and of going to neighbouring countries to buy goods for sale. She had the will and potential, but she was illiterate and had no management skills. Tina heard about literacy classes being offered in five communities, including Greenville, by the UN Women-led Joint Programme on Gender Equality and Women’s Economic Empowerment (JP GEWEE). She joined the classes and continued on to take business management courses facilitated by Educare, one of UN Women’s partners. Tina was not alone. Through a comprehensive approach to building women’s entrepreneurship and creating an environment which enables women to empower themselves, this programme has been able to transform the lives of over 20,000 Liberian women like Tina since 2009. “A multi-sectoral and holistic approach to the economic empowerment of women has created the space for rural women to develop their potential as economic actors and gain greater recognition for their contributions to driving the economy in Liberia,” says Sheelagh Kathy Mangones, UN Women Representative in Liberia. For Tina, the business class exposed her to management strategies and skills that helped improve her business. She learned budgeting skills, including how to save a small percentage of the profit for emergencies. 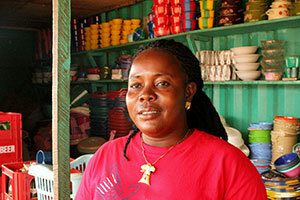 Eventually, Tina’s savings grew and she was able to travel to Guinea, a neighbouring country, for new goods to sell. She expanded her inventory, and bought bags of dried pepper and other agricultural produce to trade. Her income grew immensely, as did her savings, and she joined the savings and loan training class of the JP GEWEE programme. Upon completion, she became part of the Village Savings and Loan Association (VSLA) of the Association of Women in Cross-Border Trade, where her savings improved, and could soon take bigger loans. Tina’s story is similar to that of the more than 4,000 rural Liberian women who joined Savings and Loan Associations between 2010 and 2012. Their average individual savings are of USD 430 and average loans of USD 1,179 by their second year. “The Village Savings and Loan Associations give the opportunity to rural women to build their financial security and therefore be more empowered to continue moving forward autonomously,” says Deola Famak, of Educare. Tina further expanded her business after travelling to West African countries like Ghana, Nigeria and Togo to buy goods. Eventually, she became a cross-border trader. Today she lives in Greenville and runs a big shop with clothing and household provisions. Speaking of all the changes, she says: “I started seeing things differently and thinking of big things; it was like removing a cloth from my eyes. I then said to myself: my business is my world. What used to be a dream for me is now a reality,” she beams. Cross-posted from and with the permission of UN Women. The UN Women-led Joint Programme on Gender Equality and Women’s Economic Empowerment (JP GEWEE) offers a comprehensive programme to promote women’s literacy, business skills, entrepreneurship and savings, is transforming the lives of over 20,000 rural women in Liberia. This entry was posted in Inspirational, Mother, Women and tagged female entrepreneur, Gender Equality, herstory, inspiration, Inspired by my mom, inspiring story, Liberia, Mother, UN Women, Woman, women's empowerment. Bookmark the permalink.